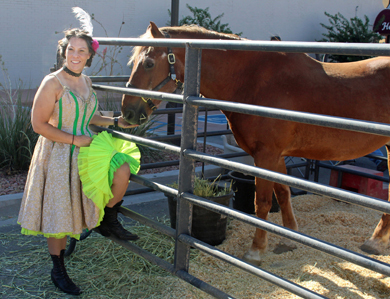 Above, Jenna Secrist, membership director for the Artesia Arts Council, decked out in full Wild West regalia, pets Red, a once-wild Mustang from Nevada now residing in Artesia Saturday during National Day of the American Cowboy festivities downtown. 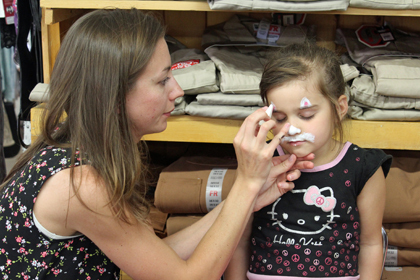 At right, a young girl has her face painted with cat features at Bennie’s Western Wear. 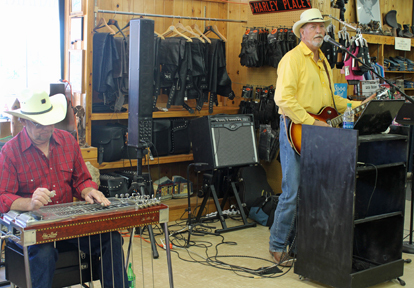 Below, rising country singer Will Banister of Portales, right, gives visitors at Bennie’s a sneak preview of his Saturday evening concert at the Ocotillo Performing Arts Center. 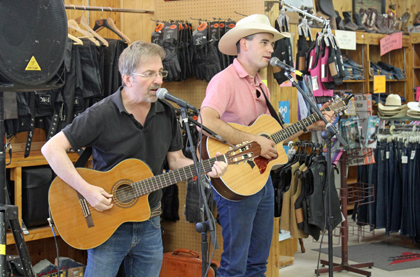 At bottom, local singer Rick Carlisle performs “Amarillo by Morning” at Bennie’s.